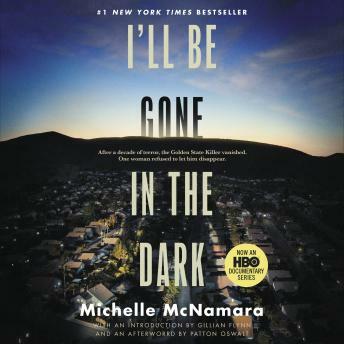 Listen to "I'll Be Gone in the Dark: One Woman's Obsessive Search for the Golden State Killer" on your iOS and Android device. Three decades later, Michelle McNamara, a true crime journalist who created the popular website TrueCrimeDiary.com, was determined to find the violent psychopath she called 'the Golden State Killer.' Michelle pored over police reports, interviewed victims, and embedded herself in the online communities that were as obsessed with the case as she was. I LOVE this book! Could not stop listening. An amazing story. Really well written. This was an awesome book. Bracing writing style by McNamara. Well-researched is an understatement. This is one of the best books we have listened to. My family lived in Rancho Cordova during this period. My brother actually knew and hung out with one of the policeman mentioned in the book. The details are fantastic. I had no idea when I bought this book that we had a personal connection to the area. The story was overall interesting and the narration was excellent. However, the nonlinear telling was confusing, and at times it was tedious; as a result my mind frequently wandered. This novel is very well written. Being a true crime novel, Michelle McNamara does an exceedingly well job at conveying compassion and empathy for the victims and their families. I don't read a lot of non fiction and even I can appreciate the time and effort Michelle McNamara put into this novel. She put herself in it as well, and you can see how she was obsessed in finding the Golden State Killer. A highly absorbing read. Amazing amount of due diligence and research that went into this book. One can only imagine how this became almost all-consuming by McNamara, it's written with great insight not just facts. Gripping book. Expertly researched. Narration was excellent. I think this book may have been a little easier to read on paper versus the audiobook. There were too many characters and the author did not go in chronological order so it became a little confusing. The story was interesting but slightly disorganized and repetitive.